I have a weakness for hand-embroidery. It seems it has become a lost art among today’s industrialized manufacturing and usually reserved for larger textiles. However, my appetite for this small handicraft has been appeased by our uncommon collection of embroidered accessories. Our artisans begin by hand-weaving the fabric base for all our embroidered jewelry. Then once the small patch of fabric is framed, an artisan carefully begins to hand-stitch the pattern onto the fabric. Some are graphic pre-Columbian tribal patterns and others employ the more floral Spanish Colonial motif. 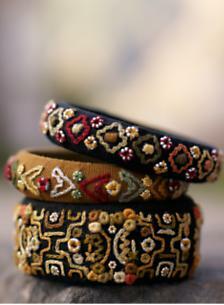 Often they are accented with beads but all designs use satiny pima cotton threads as their medium. The detail is so finite and perfect; everyone pulls you closer just to take a discerning look. I like to wear them with my favorite sweater and jeans. They are also a beautiful finishing touch when heading out for a night on the town. Just be prepared to stop and allow for spectators! I cannot explain why I am so obsessed with the mystery. Nor can I justify my time spent in the relentless search. However, the question still remains…..what is the flower depicted on our Exotica Skirt? 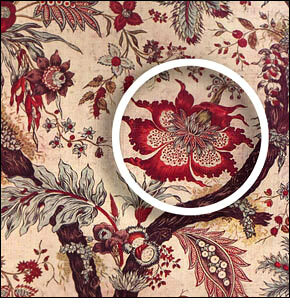 I spoke with the designer and she told me that it was inspired by a flower in a large 18th century French textile (see above). She did not know the exact botanical species except to offer that it looked tropical. Many blurry pages later I can only conclude that the flower must be an artist hybrid. A stylized combination of blooms. Perhaps a Water Lily combined with the flower of a Floss Silk Tree or a tropical Dahlia mixed with the pedals of an Iris. I now pose the question to you, our blog audience. What do you think our exotic flower could be? September 19, 2007 It Made Her Cry! I have to laugh when I see our Fiesta Pinafore dress – not because it is funny looking in any way but rather I recall the reaction given to it by our stylist last Spring when she saw it for the first time. Our stylist has many years of experience, working for clients as diverse as California Closets and Vogue en Español, and her wealth of experience carries significant weight to us. After a long day of showing her dozens of styles in need of revision we finally came to the Fiesta Pinafore. I’m not being dramatic when I say…she actually welled up! A single tear fell. Needless to say, she was pleased with the design and we were thrilled to have finally got it right. We still tease her about to this day. It’s not too late. There are still some warm days left! Perhaps you will get the same reaction when you wear it. On our recent photo shoot to Cuzco, Peru for our Holiday catalog, we had the pleasure to work in the company of a group of camelids. We were immediately in love. They were fuzzy and adorable in a multitude of colors from toffee, black and white spotted to simply pure white. Their Andean caretaker was kind enough to let us borrow them for the day, and with her herding and our patience, we managed to get a beautiful catalog spread. However, we were uncertain if our camelids models were alpacas or llamas. A piece of camelid trivia: one of the oldest alpacas on record, fondly called "Vomiting Violet" lived in New Zealand and died in 2005 at the ripe old age of 29. With Fall fast approaching, sweaters come out of the closet and my thoughts turn to one of my favorite winter pastimes, knitting. Since I work for a knit wear company you may be asking yourself, "Why bother?…Just buy something!" Trust me, I buy my share of Peruvian sweaters. The truth is that Peruvian Connection sparked my interest in knitting because of the parade of beautiful hand-knits that I see day in and day out. So I asked my mother-in-law to teach me and I made a really mediocre scarf! However, I was hooked. For me the actual craft of knitting is an enjoyable form of insanity that I can’t help but indulge for myself. After knitting for a couple years, I have gleaned a few hard-learned pearls of wisdom that I am eager to share with the budding knitter. So if you also feel the urge to learn the craft of knitting this season, then join me over the next few weeks and we will expand our skills together.